A Soulslike ‘God Run’ is quite a masochistic feat. Beating any one of FromSoftware’s titles is something of an ordeal, and doing so without dying is another task altogether. One streamer, however, is working on something even more horrifying – playing through all five games without taking a single hit. TheHappyHob was doing pretty well in his latest attempt at the God Run. He’d breezed through all three Dark Souls games, as well as Bloodborne. 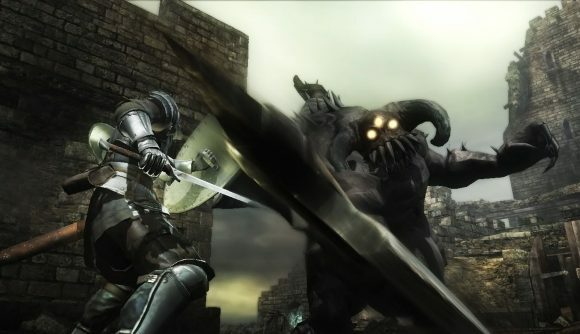 From there, his fifth and final challenge was Demon’s Souls, the predecessor to the rest of the series. Sadly, however, things went very wrong, very quickly. The tutorial boss in Demon’s Souls is called Vanguard. It’s a slow-moving creature, not dissimilar in stature (or complexity) to Dark Souls’ own tutorial boss, the Asylum Demon. Vanguard is actually an optional boss, but TheHappyHob decided he wanted to take it on in order to make sure his final boss total would be 69. Unfortunately, that decision would quickly prove to be the streamer’s undoing after hours of untouchable play. As you can see in the Twitch clip embedded below, one of Vanguard’s attacks sees rubble rain from the roof above him in a slightly unpredictable manner, and it’s one of those bricks that proves to be the streamer’s downfall. Fair warning – there’s some pretty loud yelling after that happens. Not to be deterred, TheHappyHob started the whole thing over again, this time switching up the order. After dealing with Bloodborne in a matter of hours, he dispatched Vanguard quite easily, before dying to an undead soldier a few minutes later. The streamer has been working on mastering the Soulsborne series for several years, his most impressive effort to date being a God Run of the entire Dark Souls trilogy. Whether he’ll be adding Sekiro: Shadows Die Twice to his list after it releases remains to be seen, but a bigger concern (in my opinion at least) is what we’re going to call the collective after that. I’d like to start off by suggesting Soulsborno, but early focus groups in the PCGN office have proved averse to my new name.